Excellent world building by Kevin M. McGreer in this futuristic look at our world. Add a cast of colorful characters maneuvering through a complex plot and you have an exciting story guaranteed to keep you up far past your bedtime. The story takes place in Hades Ring, an area once known as the Chicago Loop. And Hell is a just description for those poor unfortunate souls trapped inside it, people like Pio Bardanaro, a young man who survives with the use of powerful psychic powers. If you want to survive inside the Ring, one learns quickly to stay alert, and in Pio’s case it means offering up his unique talents to a crime lord boss, because even a man as powerful as Pio can’t hope to make it alone, not while trapped inside Hades Ring. Out of the depths of hell climbs a creature born when the Earth was still brand new. Cain, the first recorded murderer, is set free for reasons even he doesn’t know. Cain is a bloodthirsty monster who cares for no one but himself and his terrible hunger for blood. But Pio senses it would be wise to keep the cursed monster close, as a friend if he can manage it, especially when he learns his boss has made plans to sacrifice his life in a bid to take total control over Hades Ring. With Cain’s help, Pio hopes to find a way free of the Ring. 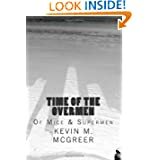 Pio and Cain are only two of the many intriguing characters we meet in Time of the Overmen: of Mice and Supermen, each part masterfully woven into an intricate plot that left this reader hungry for the next installment to become available. Posted by Denna Holm on September 26, 2013 in Archives and tagged fantasy, five stars, futuristic, Horror, super powers, telepathy, thriller, vampire. Thank you, Denna, for that encouraging and supportive review. I just happened upon it today when visiting my Author Central page. Took me by surprise, to say the least. Appreciate it.